Well, when I found the Swarovski USB flash drives from Samsung, my eyes became sparkling. Imagine, these stuffs are like functional jewelry. Samsung is very clever to combine the bling-bling with the USB flash drives. There are 3 models offered by Samsung, the Swarovski Crystal USB Necklace 8 GB Storage Lock Pendant, that has pretty padlock shape, 8 GB Jewelry USB Flash Drive necklace and 8GB Jewelry USB Flash Drive/necklace or Keychain that can be used as beautiful pendant. These USB flash drives are also equipped with a beautiful chain, so you can use immediately as a necklace. 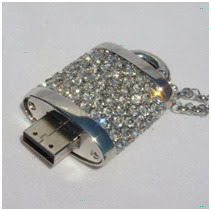 I bet your USB flash drives bling-bling will be amazed by your colleagues.